Effective April 1st, 2019, a district tax increase will be applied in several localities throughout California. The rate increase is due to the passing of numerous Measures in various counties on November 6, 2018 to fund several improvements such as street improvements, maintain essential services, neighborhood safety, disaster preparedness, among others. 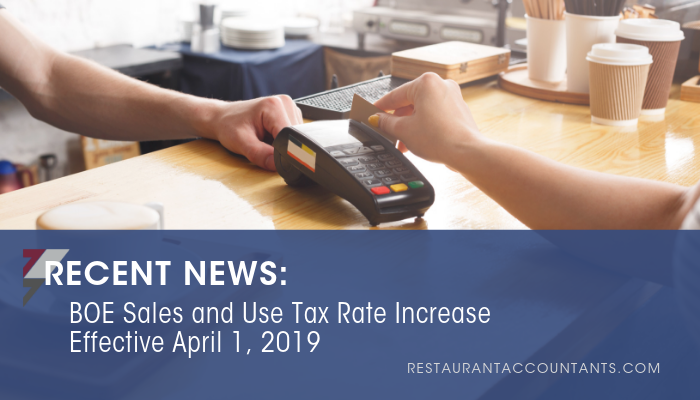 To all restaurant operators, we highly advise you to set-up a reminder to update your POS systems to reflect the new sales tax rates as of April 1st per the chart listed below. For guidance on city and county tax rates affecting the restaurant industry, please contact Melissa Cunarro at melissa.cunarro@krostcpas.com.